An Economic 'Sell' Signal by Christmas? With the U.S. presidential election out of the way, the economy has taken center stage lately and for good reason: the economy typically benefits during a presidential election year while the 4-year Kress cycle is also peaking. The latest economic reports strongly indicate that the U.S. consumer has benefited (or at least feels he has benefited) from this year's presidential cycle and the loose money it typically brings. The 4-year cycle peak is over, however, and year 2012 is coming to a close. Unless the Obama/Bernanke administration can pull an ace from its sleeve - and soon - 2013 is looking to be far bleaker than 2012. Earlier we mentioned the positive payroll report that was released on Friday. The U.S. economy has become a source of optimism in the mainstream financial press lately, helped by improving numbers in the jobs market, retail sales, real estate prices and consumer confidence. By one measure of consumer confidence, consumers haven't been this optimistic about the economy's prospects since 2007. Retail sales have increased for three consecutive months, while the U.S. savings rate fell from 4.4 percent to 3.7 percent from the end of June to the end of August. Clearly, the typical American consumer is feeling better about the economy. Businesses don't share this sentiment, however. Companies of all sizes are reducing the number of investments they make, causing capital spending to drop. According to Bloomberg Businessweek, "Orders for non-defense capital goods, a proxy for expectations of future business spending plans, fell at an annual rate of 17.8 percent from July to September, the steepest decline since the first quarter of 2009, the last few months of the recession." Businessweek further pointed out that company CEOs are gloomier on the profit outlook than they've been since the third quarter of 2009 and foresee slower economic growth for 2012 and have lower expectations for sales, capital expenditures and hiring. As one analyst observed, "Corporate earnings do not paint the picture of such a positive consumer that we're seeing." Although there is not a definite correlation between consumer spending and corporate spending, businesses do tend to be more forward-looking than consumers. Could it be that corporate America sees something on the economic horizon that consumers don't see - something that has made corporations fearful of spending? The year 2012 has been a relatively good one for the economy but keep in mind that after the 4-year cycle peaks the momentum behind a strengthening economy tends to wane. The first year of a presidential cycle is typically one of the worst and that doesn't bode well for the 2013 outlook. 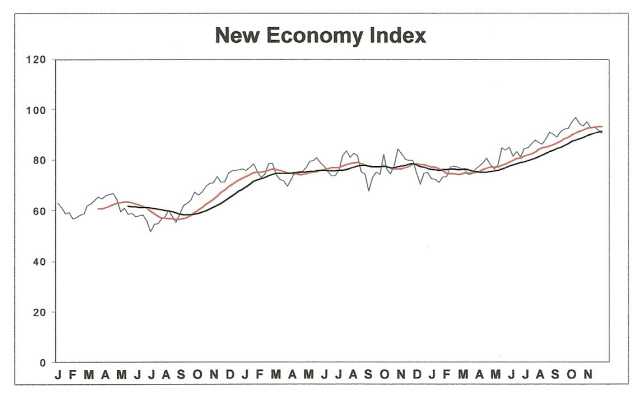 What I find somewhat troubling is that while our in-house New Economy Index (NEI) is still technically in a rising trend, it has been weakening in recent weeks and has already fallen below its 12-week and 20-week moving averages for the first time since 2011. If the 12-week MA falls below the 20-week MA while the index itself is declining we'll have the first economic "sell" signal since early 2010. That in turn would bode ill for the 2013 outlook and would pretty much confirm the bearish picture the Kress cycles paint for next year. The NEI is still a few weeks away from completely rolling over and likely won't give a sell signal before Thanksgiving. If it does confirm a sell signal by the end of this year then we'll be able to say that the latest spate of bullish economic headlines was a classic case of everything looking rosy at a top. We might also say that, as is often the case, presidential election years can paint a very deceiving picture of the economy. Take a journey into the future with me as we discover what the future may unfold in the fateful period leading up to - and following - the 120-year cycle bottom in late 2014. Picking up where I left off in my previous work, The Stock Market Cycles, I expand on the Kress cycle narrative and explain how the 120-year Mega cycle influences the market, the economy and other aspects of American life and culture. My latest book, 2014: America's Date With Destiny, examines the most vital issues facing America and the global economy in the 2-3 years ahead.